Ara Crystal effect. 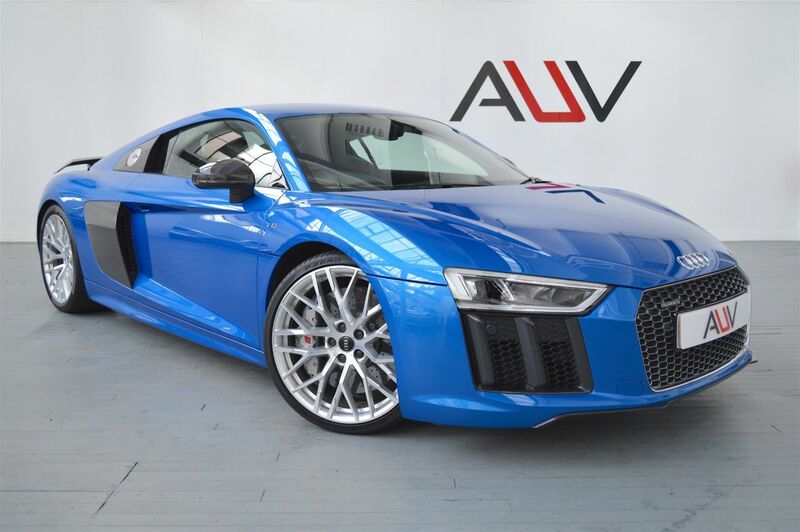 We are very pleased to offer you this truly stunning Audi R8 V10 PLUS 5.2 FSI Quattro S Tronic. The car benefits from the following specification, Black Nappa leather heated bucket seats with electric height adjustment and contrasting rock grey stitching. Black Alcantara roof headlining, Driver assistance pack, 20 inch 10 spoke Y Design diamond cut alloy wheels, Ceramic braking system, Gloss Carbon sideblades, Sound and comfort pack, Sport plus pack with sports exhaust system and magnetic ride, stainless steel pedals, Audi Parking System Plus, Front and Rear, High beam assist, LED headlights, Carbon door mirror housing, Exclusive carbon package, Large fixed rear boot spoiler in gloss carbon, V10 plus gloss carbon styling, Extended matt carbon interior inlays, Bang & Olufsen sound system, Audi virtual cockpit, Audi phone box with wireless charging, DAB Radio, MMI Navigation Plus with MMI Touchscreen, Voice control, Rain Sensor, Start - Stop System with Recuperation. A stunning example with a fantastic spec, one owner from new serviced at Audi Leicester October 2018. Before you reserve a vehicle we ask that you read both our Business and Warranty conditions in the 'Terms' tab above. Specialists in vehicle financing we can offer our clients market leading, bespoke funding packages. Finance examples are subject to status, regulated and monitored by the FCA. Goods and services are supplied by Approved Used Vehicles Ltd. For further information on how to reserve this vehicle or tailor your finance package please call us on 01455 446505.